Bet you couldn’t resist saying “play along” after the headline and now you’ve got an ear-worm in your head as the song keeps playing over and over and over again. But just look at the heavenly ambrosia-like plate of nice juicy lamb cutlets and hot crispy potato wedges with a side of crunchy salad in the picture above. Even the brown gravy to complement the lamb was delicious down to the last drop. 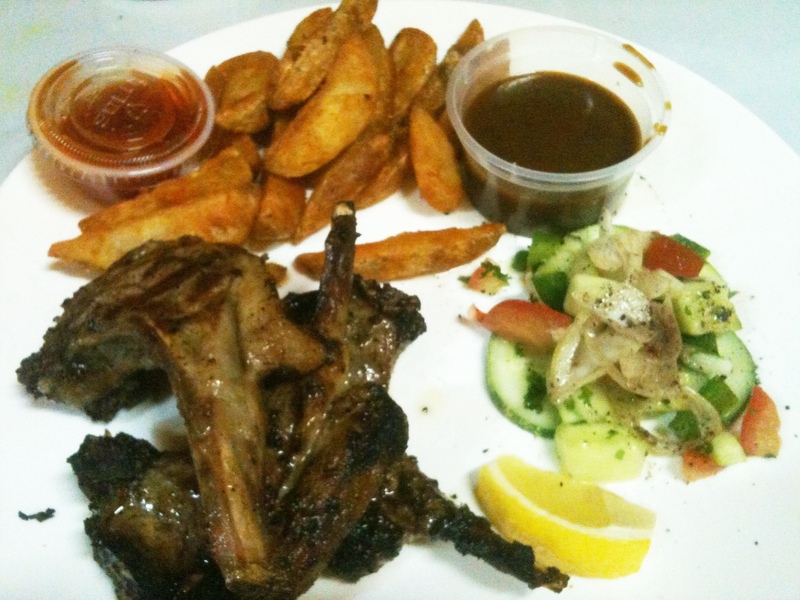 Tell me you can resist that and I will show you a human who has yet tasted the best lamb cutlets ever. I had it for supper on Saturday for the second time in my life and I can’t stop thinking about it until now. To think I only ate it for the first time a few weeks ago. My life was nothing before I met this dish. Nothing, I tell you. Seriously. Everything about this dish is just so awesome. Look at it. If you were not a meat lover before, you ought to be now. The meat is tender, with the right amount of juicy fats lacing the sides of the bone. You dip a piece of the meat into the succulent brown gravy. There is a slight tinge of smoky crispiness as you chew into it, letting the gravy swirl around. I just made myself hungry.